Back in February Sphero revealed a wearable controller for its Star Wars BB-8 rolling droid, which could be used in place of the app. Today we've seen what it looks like in its finished form - and even glimpsed it in action. The Force Band, as its named, is designed to evoke a feeling of using the Force to control the robot, guiding it from place to place with a wave of the hand. The motion controls work via accelerometer in the watch, which interfaces with the existing app via Bluetooth. 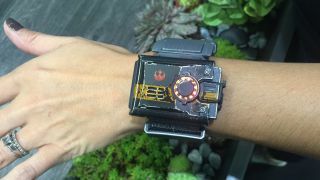 The new band is quite different to the early version Sphero showed off back at CES 2016 - its gunmetal design is intended to match the new weathered BB-8, which the watch will come bundled with. But the band is also compatible with the existing (cleaner) BB-8 toy and will be available to buy separately. Sphero tells us the band will be available this Autumn, but can't confirm a price just yet. James O'Malley contributed to this report.